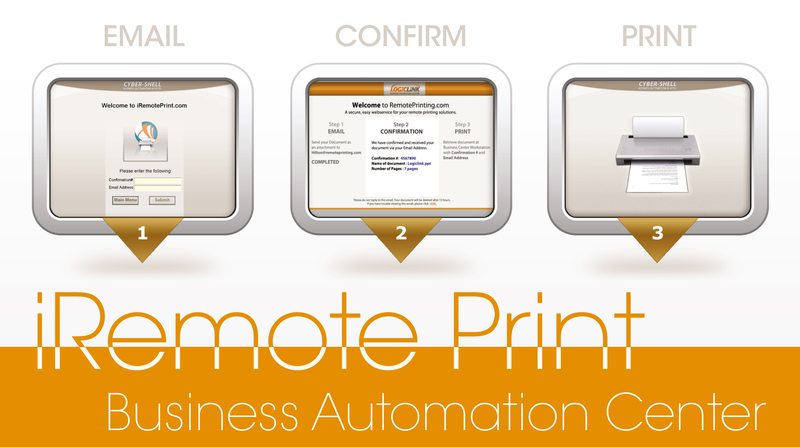 With iRemote Print technology, guests can print documents to your Business Automation Center or Cyber-Shell Kiosk printer directly from their mobile devices: Smart phones, iPads and other tablets, laptops, and notebooks. Unlike many other remote printing services, iRemote Print operates directly on the mobile device without any 3rd party software. Using any native client, your guest can simply attach a document (DOC, PDF, XLS, JPG or other common format, up to 28MB in size) to an outbound email and send it to print@iRemotePrint.com. They will receive an automatic email response containing confidential, six-digit retrieval code. Your guest may retrieve their documents at any of Logiclink Business Center or Cyber-Shell Kiosk Stations. They will enter the secure retrieval code and email address to initiate printing. Guests may print a document up to three (3) times within 48 hours before it is expunged from our servers. iRemote Print ensures data protection by transmitting attachments through Logiclink’s secure co-located servers. All documents are safely deleted from our servers 48 hours after submission.